Starcloth and draping are two of the easiest ways to transform a space, they both add warmth, texture and colour to a room without much effort, which is why we offer starcloth and drape hire here at Stagecraftuk. The service we provide for our starcloth and drape hire is second to none. From beginning to end we will be by your side ensuring that the service provided, results in a smoothly ran event. What can you expect from us? At the start we will discuss what you want to achieve for your event from the starcloth and drape hire, it may be for visual effects, to create breakout rooms, or simply to make the room look more appealing. If we haven’t been to the venue before and we are installing the drapes or starcloth, we will come to site to see what options we have to work with. From this, we will go back and create a quote. Or, if it is a dry hire, just let us know what you require and we will get it quoted and booked in. Due to the nature of our industry, having a stock of starcloth and drape on hand as we do is very much an advantage. Not only are we able to supply to events taking place in house, but we can provide starcloth and drape hire to external events and dry hires. For the first part of our starcloth and drape hire stock, we will be looking at our starcloth. We have over 50 cloths within our starcloth stock, with our sizes going from 3m, 5m, 6.5m and 7.5m drops, all of which are 3m wide. The beauty of our cloths is that they can be hung both ways, so you aren’t limited in drop or width sizes. 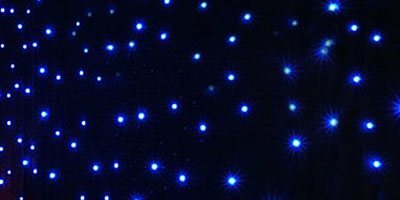 From a more technical side of starcloth, all of our starcloth cloths are RGB, meaning we can programme the lights to different colours along with having them twinkle at different speeds if required. This ability to do this is great for clients wanting to create a theme, or incorporate their brands colours into the room. When talking about components, it is standard for our cloths to go out with a 16amp lead, a DMX cable and one PSU (power supply unit) per 2 cloths. Next we move onto the draping side of our starcloth and drape hire article. Within our stock we have both black wool serge and white voile drapes. Again, like our starcloth they come in various sizes, making them versatile to fit your needs. To decide whether you want to go for starcloth or drape, or event both, you need to be able to visualise what you want your space to look like. Determining between starcloth and drape hire also depends on what type of event you are having. Typically, gala dinners and weddings have starcloth and conferences and exhibitions have draping. The reason for this can be because of what the main focus of the room is. For gala dinners and weddings, it is all about décor and drawing the eyes around the entire space, whereas with conferences and exhibitions, the main attractions are the speakers, presentations and exhibition stands. Of course, your starcloth and drape hire does not have to fit these moulds, as it is entirely up to you! For our 2017 Annual Dinner we wanted to utilise both our white drapes and starcloth to give the room a feel of elegance to match the ambiance of the event. The use of the white drapes over the starcloth created a softer lighting effect, and allowed us to use uplighters to change the colour of the room. Why you should choose Stagecraftuk! We have extensive experience within the starcloth and drape hire industry, meaning we know exactly what we are doing. We are able to provide you with ideas on how to transform your space through the use of our starcloth and drapes. Whether it is onsite or offsite, we will be with you every step of the way to ensure your event runs smoothly.